The 8th Annual Rivers and Spires kicked off today with the unveiling the refurbished Doughboy statue honoring World War vets. The Statue was rededicated in a ceremony in front of the Clarksville Transit Station on Legion Street where the statue will remain on display. 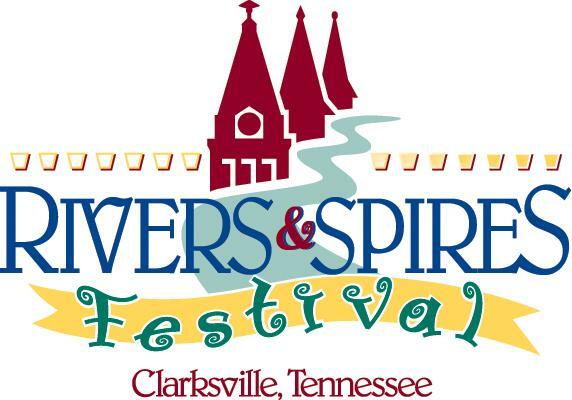 The Clarksville Leaf-Chronicle led the drive to raise the funds needed to renovate the badly damaged statue. 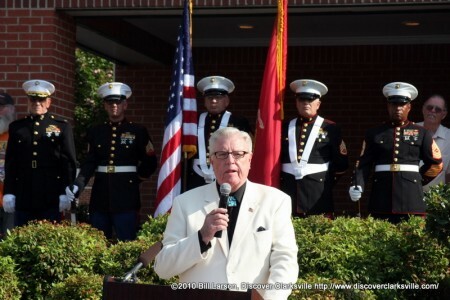 Current publisher Andrew Oppmann welcomed the crowd to the ceremony, then after the posting of the colors and the playing of the national anthem, former publisher Gene Washer took over at the podium. Washer said “I made the initial inquiries about restoring the statue, and that was the quickest way to be given the job.” to which the crowd laughed. The Save our Doughboy committee was made up of Doug Barber, Ned Crouch, Jim Durrett, Dan Hanley, Theresa Harrington, Thomya Jenkins, Frank Lott, Alane S. Megna, Andrew Oppmann, Mayor Johnny Piper, Alan Robinson, Richard V. Stevens, Vicki T. Wallace, Gene Washer, Eleanor Williams, and Scott Wise who was the restoration’s projects sculptor. 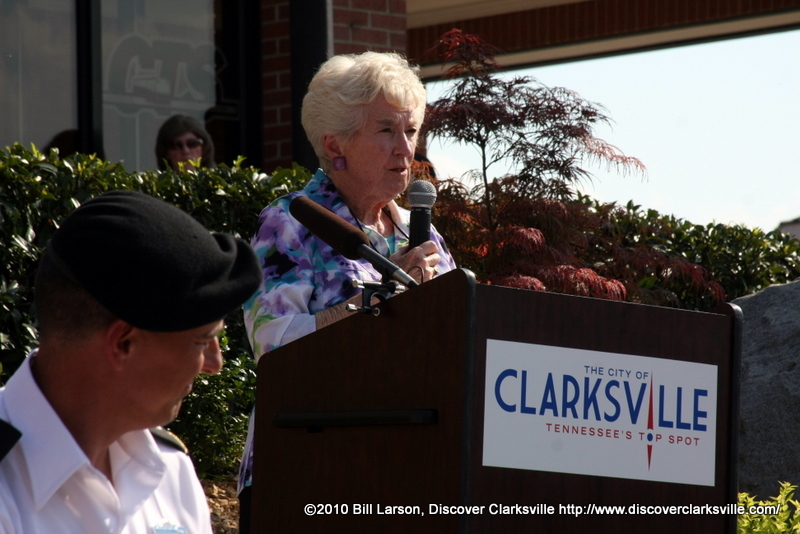 Eleanor Williams the Montgomery County Historian gave a short history of the Doughboy statue from its original placement at the old Clarksville High School on Greenwood Avenue, to it’s relocation to the National Guard Armory on Fort Campbell Blvd. She also ran through several theories on why the WWI soldiers were called Doughboys, and pointed out that the statue does not say “World War I” instead it says “World War” due to the fact that at the time it was originally created there had only been one. 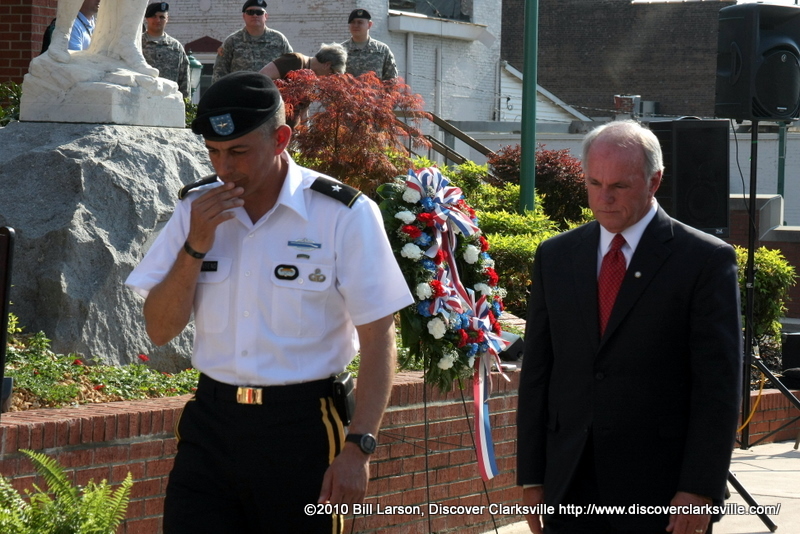 Andrew Oppmann then presented the statue to the City of Clarksville on behalf of the committee, which accepted by Clarksville Mayor Johnny Piper. 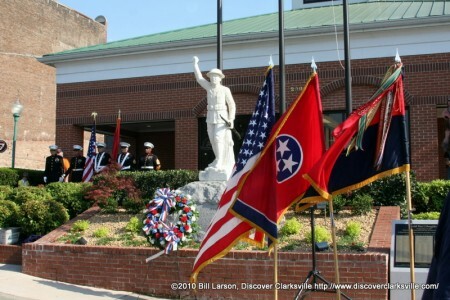 The statue was unveiled by George Edward York and Betsy York Lowery, the children of Tennessee’s most notable World War I hero Sergeant Alvin C. York. They were joined by other children of WWI veterans many of whom brought photos of their family member with them. George York was a fiery speaker who was able to stir up the crowd. He ended his remarks by singing a patriotic song from the first world war. But don’t be ungrateful to me! Don’t bite the hand that’s feeding you! Mayor Piper and Brig. Gen. Sephen Townsend then placed a wreath on the Memorial, and as taps was played a volley of gunfire solemnized the occasion. Then the colors were retired, and the 101st Airborne Division Chaplain gave the benediction. With the re-dedication finished many of the attendees moved to the Public Square Stage to catch a free performance of The Roxy Regional Theatre‘s High School Musical 2. 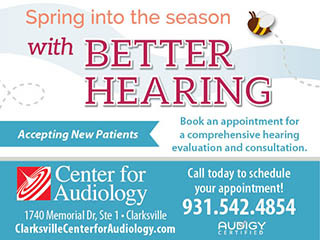 While others headed to the Patchwork Premier, a new event for area seniors.